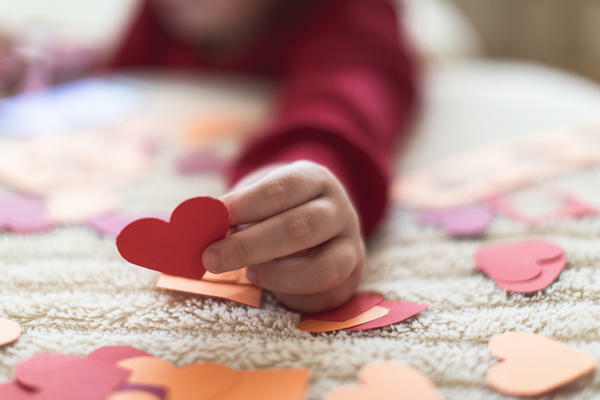 Instead of greeting cards and chocolates this Valentine's Day, poet Kwame Alexander has packaged up for you a poem inspired by kids' definitions of love. Last month, NPR asked elementary and high school teachers to give the following prompt to their students: "Love is ... " Students then filled in the blank with a line or, in some cases, a whole poem. Teachers from around the country submitted what their students wrote; NPR received more than 2,000 entries. Alexander read through them and created one big love poem. "Kids finding their voice and lifting it up, for love," he tells NPR. "Nothing more powerful than that." The missing piece that fulfills every puzzle. Love is bad lo mein and Moana on a Wednesday night. the feeling you get when you find the perfect series on Netflix. Love is basically just an attraction you get so humans can repopulate. they're the ones who created you, but what do you mean by that? Do you love them for creating you, only to die? the smell of fresh daisies and laundry sheets. Love is raindrops caring for the plants. Helping them to grow to great big trees. Making a loving home for the creatures of the forest. Dying only to give fertile soil for the plants to come. Love is a game of chess, you'll never win until you make a move. Love is saying sorry when I hate to be wrong. Love is when even though you might not want to do it, you do it because you love your parents. Love is accepting everyone no matter their beliefs. No matter what they look like. A reward not gained easily. Love is a song from Kendrick Lamar. That's it. Love is a day full of hugs. Vince Pearson and Ashley Brown produced and edited this story for broadcast. Heidi Glenn adapted it for the Web. A poet once said, there's a lot of love around us. But if our hearts aren't open, we won't see it. That poet is Kwame Alexander. And he is here with us on MORNING EDITION to celebrate Valentine's Day. Hey, Kwame. KWAME ALEXANDER: Hey. I knew that sounded familiar. MARTIN: So is your heart open? ALEXANDER: Always with you, Rachel. Happy Valentine's Day. MARTIN: Happy Valentine's Day. So when we were last together, we asked teachers to share a prompt with their students about love, right? ALEXANDER: Yes. We asked students to fill in the blank, love is - and I hear we had an overwhelming response. MARTIN: We did. We got more than 2,000 entries from across the country. And you have brought a friend in with you today, a teacher, to share what it's like to do one of these prompt poems. Ann Marie Stephens is a children's book author and first grade teacher in Manassas, Va. And she's in our studios. Ann Marie, thanks for being here. ANN MARIE STEPHENS: Thank you for having me. MARTIN: All right. So, Ann Marie, this was not your first time doing a poetry prompt. Can you tell us how this went down? STEPHENS: It is. It is. MARTIN: ...Valentine's Day love prompt (laughter). STEPHENS: But every kid has felt sadness. STEPHENS: And when you're in first grade, you want to tell every detail about it. STEPHENS: So they gave me a lot of details about sadness. And then I switched it up to, love is - and we had to get past a lot of, ew, and, gross. Once that happened, I said to them, love isn't just hugging and kissing and other gross stuff. STEPHENS: ...Or loving a food, like popcorn and that there were no wrong answers. So after I told them all of this, they ran off and grabbed the poetry paper and started writing. And they were coming out with lines like, love is when your dad comes home from war. MARTIN: So in general, why poetry? I mean, why do you think that's important to carve out time in your teaching? STEPHENS: Poetry isn't just important. In my eyes, it's necessary. I believe that schools are testing our kids to the point of exhaustion. And so we end up knowing where they are academically, but we don't know where they are emotionally and mentally and physically. And poetry helps us do that. When kids can write poems, they get to share their backgrounds and their experiences and their interpretations of the world with everyone else. And once we get to know our kids, our students, like that, really get to know them, we can teach them anything. MARTIN: Let's hear some of your students' poems. STEPHENS: Yeah. So first, you're going to hear two of my former students, Simone Ward and Siany Valdez. And they're both 8 now. And then you're going to hear from one of my current first graders, Anderson Garcia. And he's 7. SIMONE WARD: Love is kind. Love is peace. Love is happiness and sadness because sometimes, someone leaves you. And you still love them. Love is everything. SIANY VALDEZ: Love is stronger than mean. I know this because I see it in my heart. I see it in my teacher's smile. I see it when I'm with my family. I know you are loved, too. I see it in your eyes. STEPHENS: So to translate that last poem, it means, love is when my heart opens and I see chocolate hearts twirling around my eyes. MARTIN: Those are amazing. Those were surprisingly moving. Thank you for sharing those. ALEXANDER: Kids finding their voice and lifting it up for love - I mean, Rachel, there's nothing more powerful than that. MARTIN: Right? So just like Ann Marie, teachers from around the country shared this prompt with their students, love is - teachers like Mr. Lawson at Franklin Township Middle School West and Ms. Rockwood at Lewiston Elementary School. ALEXANDER: And don't forget the high schools. We got to shout them out, too. Several teachers at Norwood High School in Massachusetts used our prompt with their students. MARTIN: OK. So, Kwame, you took all these beautiful, individual entries and, basically, treated them like ingredients and made one big, delicious - I don't know - paella, big casserole of poetry. ALEXANDER: We got a gumbo. You ready to dig in? MARTIN: Yeah, gumbo. OK. Yeah, let's do it. ALEXANDER: Love is flying to the moon when you see each other, that intricate Rubik's Cube that takes you light years to unravel, the missing piece that fulfills every puzzle. MARTIN: Love is bad lo mein and "Moana" on a Wednesday night, the feeling you get when you find the perfect series on Netflix. Love is happiness, tiny, puppy kisses, sister hugs, the brother she misses. ALEXANDER: Love is flower. You are its seed. What is love if not naive hearts set ablaze, the flames of which gradually extinguish to finally expose the remains of what once was, a make-believe connection. MARTIN: Love is basically just an attraction you get so humans can repopulate. Of course, you love your parents. They're the ones who created you. But what do you mean by that? Do you love them for creating you, only to die? Love isn't real. Love is fairy tale weddings and happily ever after. ALEXANDER: Love is unexplainable, unexpected, something you can't find but it somehow finds you, the thing that makes you want to stay, the smell of fresh daisies and laundry sheets. MARTIN: Love is patient. Love is scary. Love is learning. Love is confusing. ALEXANDER: It's the gathering together, removing evil forces, starting discourses, the comfortable silence shared. Love is an idea everyone should be allowed the right of in whichever way they choose. MARTIN: Love is a game of chess. You will never win until you make a move. Love is saying sorry when I hate to be wrong. Love is when even though you might not want to do it, you do it because you love your parents. Love is accepting everyone no matter their beliefs, no matter what they look like. ALEXANDER: Difficult but not insurmountable, love is a mountain, a journey not undertaken lightly, a reward not gained easily. Love is a song from Kendrick Lamar. That's it. Love is a day full of hugs, a safe place to stay, to be. ALEXANDER: Thank you. I mean, we can learn a lot about love and loving and being loved from the kids. MARTIN: Absolutely. Kwame Alexander is the founding editor of Versify, an imprint from Houghton Mifflin Harcourt. And he's partnering with librarians around the country on his #AllBooksForAllKids initiative. Kwame, this feels like the right point to queue up some Kendrick Lamar. Shall we? ALEXANDER: Let's do it. One love, Rachel. KENDRICK LAMAR: (Singing) Love me. Transcript provided by NPR, Copyright NPR.